@WebAppConfiguration is a class-level annotation that loads WebApplicationContext in Spring integration test. When our test class is annotated with @WebAppConfiguration, a WebApplicationContext is loaded for the test using default value of file:src/main/webapp for the path to the root of the web application i.e. the resource base path. MockServletContext is created using resource base path that acts as ServletContext for WebApplicationContext. The value element of @WebAppConfiguration specifies the resource path to the root directory of the web application. The default value for value element is src/main/webapp. We can override the default path using classpath or file prefix. If we are not using any prefix then file is used as default prefix. @WebAppConfiguration is used in conjunction with @ContextConfiguration annotation. Find the sample test class example with JUnit 5. In Spring Boot application, we use @SpringBootTest annotation to create test class. Here we will discuss @WebAppConfiguration annotation with examples to get WebApplicationContext in Spring integration test. Just annotating our Spring integration test class with @WebAppConfiguration, it loads WebApplicationContext using default resource base path i.e. src/main/webapp. To override default path we can specify our path using classpath or file prefix with value element of @WebAppConfiguration annotation. Suppose we want to use test-root-webapp directory inside classpath as root directory of web application in our integration test, we can do it using classpath prefix as following. Suppose we want to use src/test/webapp path as our root directory of web application in our integration test, we can do it using file prefix as following. When no prefix is used then file prefix will be default. So we can use above code as following, too. @WebAppConfiguration is used in conjunction with @ContextConfiguration annotation. 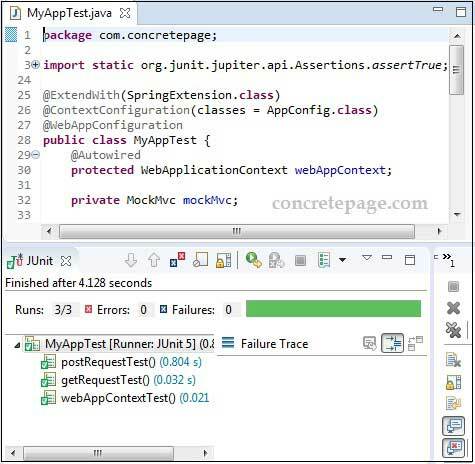 @ContextConfiguration loads an ApplicationContext for Spring integration test. @ContextConfiguration can load ApplicationContext using XML resource or the JavaConfig annotated with @Configuration. 1. Find the sample example with JavaConfig. 2. Find the sample example with XML configuration. 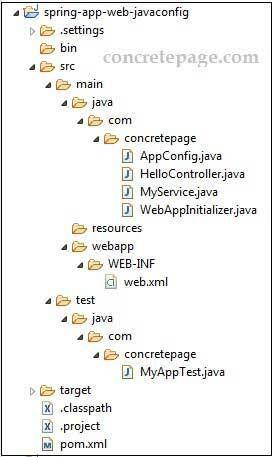 Here we will provide a complete example for @WebAppConfiguration demo using JavaConfig as well as XML configuration. We are using following annotations and classes. @ExtendWith: A JUnit 5 annotation to register extensions for test method. SpringExtension: It is used to integrate Spring TestContext with JUnit 5 Jupiter Test. @ContextConfiguration: It loads an ApplicationContext in Spring integration test. 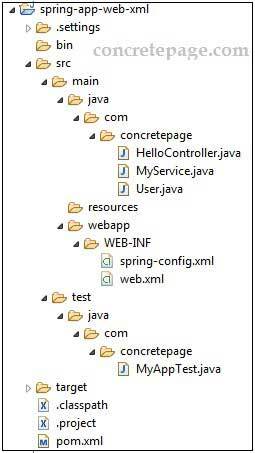 @WebAppConfiguration: It loads WebApplicationContext in Spring integration test. WebApplicationContext: It provides configuration for a web application. MockMvc: It is main entry point for Spring MVC test support. MockServletContext: It is the mock implementation of the ServletContext. Now find the main application classes. Find the code snippet of our test class. Spring provides @SpringBootTest annotation used at class-level, to create a test class in Spring Boot application. @SpringBootTest has following features. 1. Uses SpringBootContextLoader as the default ContextLoader. 2. Provides support for webEnvironment modes. 3. Registers a TestRestTemplate or WebTestClient bean for use in web tests. So we need not to use it explicitly. Find the sample example of a test class based on Spring Boot application.